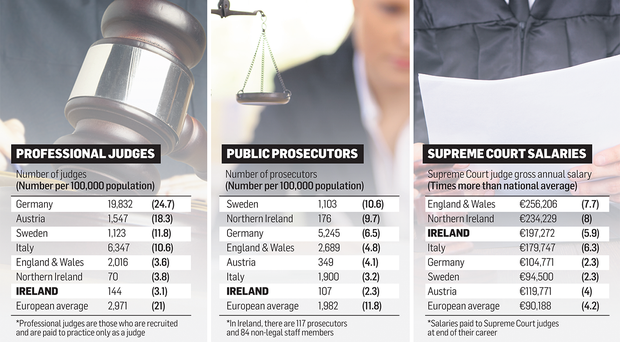 IRELAND has the lowest number of professional judges in Europe, but they remain among the best paid for their work at the end of their careers, according to a new report. The report of the European Commission for the Efficiency of Justice (CEPEJ) says that Ireland has experienced a 28pc decrease "in absolute terms" in its annual public budget allocated to all courts between 2010 and 2012. This compares to the Europe-wide average increase in courts budgets of some 5.4pc. And Ireland has remained at the bottom of the CEPEJ league for the number of professional judges and public prosecutors in Europe. But Irish Supreme Court judges earn more than double the average gross salaries of their European counterparts. The 2014 report, which evaluates European judicial systems, covers 45 of the 47 Council of Europe countries and is based on data from 2012. The report adds that the salaries of judges at the end of their careers have decreased in several countries, including Ireland, in line with the decrease in the national average salary. The CEPEJ says that the remuneration of judges is "a delicate issue" and judges' salaries throughout Europe should be "treated with caution". Some countries recruit judges when they are young while others, like Ireland, appoint judges after they have served lengthy careers as lawyers. The 545-page report outlines how the Netherlands and Germany dedicate the biggest budgetary effort to their judicial systems, with Iceland and Ireland investing "proportionally quite less". In Ireland, Norway and UK-Northern Ireland, courts represent less than 10pc of the public budgetary commitment to justice, says the CEPEJ, which added that this is in part explained by how the judicial system is organized in different countries. The report found that Ireland - in common with other northern European countries that share our legal system - implements one of the most generous legal aid policies in Europe. But along with the UK, Azerbaijan and Armenia, Ireland has the lowest number of professional female judges. The report comes as the Government is set to appoint seven new judges to the High Court to fill vacancies arising from the creation of the new Court of Appeal. Earlier this week, High Court President Mr Justice Nicholas Kearns highlighted the difficulties posed by the absence of judges, saying that he is "hard pressed" trying to manage the court list because he is still awaiting the appointment of the new judges. "I cannot underline sufficiently just how unsatisfactory things are," said Judge Kearns.